Microsoft’s Steven Sinofsky has been busy lately updating the new Windows 8 blog. A few days ago, he revealed the entire list of Windows 8 feature teams and now he’s decided to detail out the upcoming operating system’s USB 3.0 support. 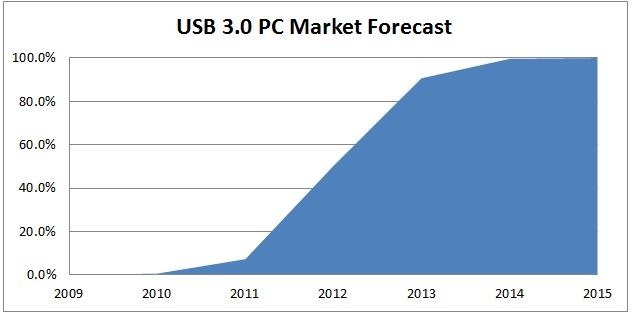 In a blog post, he reveals that, as expected, Windows 8 will be compatible with USB 3.0, the next generation of USB port, and the more than “10 billion” USB devices around the world. Unfortunately, USB 3.0 comes with its own set of challenges. To maintain support for USB 2.0 and 1.0 devices, Microsoft has had to combine their compatibility software from Windows 95 through Windows 7 with a completely new program for USB 3.0 devices. The task wasn’t easy. If you don’t believe us, check out the flow chart behind these two Windows architects, Randy Aull and Vivek Gupta. The team is testing more than 1,000 physical devices and many more using software. If they’ve done their job right, when you plug in a USB device into your Windows 8 machine, it will just work. USB 3.0 has a theoretical max data transfer speed of 5 Gbps. This half the 10 Gbps max speed of Intel’s new Thunderbolt ports, which Apple has been adopting at breakneck speed, but it’s still a big leap from what we’ve been living with for 11 years, the 480 Mbps max speed of USB 2.0. At the end of the video, Microsoft also shows a Windows 8 computer (in compatibility mode) transferring an HD movie at USB 3.0 speeds. Microsoft claims that you can transfer a full HD movie in about 80 seconds, much better than the 15 minutes it would take on USB 2.0. Sinofsky reiterates how big a focus Microsoft is making on backward compatibility with this version of Windows. While Windows has always focused on backward compatibility, it’s likely that the Redmond giant sees its historical dominance as a way to leverage any weary users to try out Windows 8, despite its innovative new interface. We look forward to learning more, but we do hope that it’s possible to transfer files to USB without having to leave the new Windows 8 interface. The more Microsoft relies on its old Windows 7 design, the weaker its Windows 8 foundation becomes.